Home News Carbon Brief Guest post: What do we know about climate change mitigation in cities? Dr William F Lamb is a researcher at the Mercator Research Institute on Global Commons and Climate Change (MCC) in Berlin. So what do we actually know about climate mitigation in cities? In our new paper, published in Nature Climate Change, we take stock of all the city case studies currently available in the peer-reviewed literature. We find that knowledge on the topic is exploding, with few attempts to grapple with the vast flow of studies. We see that the vast majority of research is on larger cities, in wealthier countries, on specific topics. And we suggest that computer-assisted methods are key to tracking work on cities and learning about solutions at a large scale. 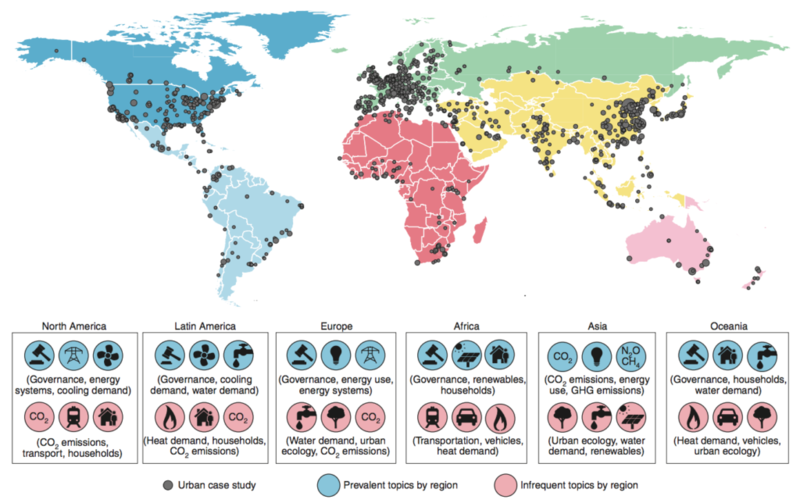 Cities used to be a marginal topic in climate change mitigation. This is no longer the case. 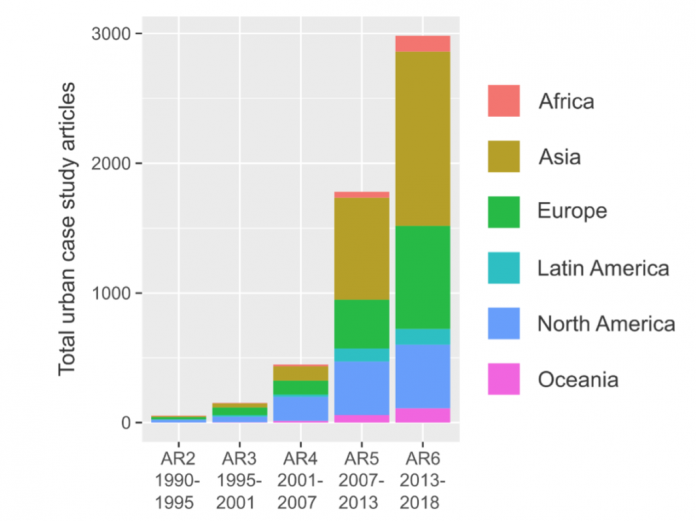 Since the fifth assessment report (“AR5”) from the Intergovernmental Panel on Climate Change (IPCC) first included a dedicated chapter on cities (pdf), the literature has jumped from a few dozen articles per year, to almost 3,000 in the past five years alone. As the chart below shows, the number of urban climate mitigation case studies published in time to be included in each IPCC assessment report – from the second (“AR2”) to the sixth (“AF6”) – has risen dramatically over time. To say we are unprepared for this development is an understatement. Urban case studies are usually treated as colourful curios in major climate reports. They are placed as dedicated boxed sections that make interesting, if anecdotal reading – such as “How did London’s congestion charge reduce emissions?” and “How does Manizales manage disaster risks?”. But treating case studies in this anecdotal way suggests we are not really learning about why cities succeed or fail in mitigating climate change. There have been no systematic attempts to map out the existing work, let alone synthesise it. We are generating hundreds of new case studies per month without even knowing what exists. 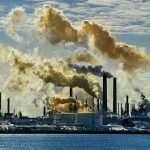 In our study, we used computer-assisted methods to quickly read and identify articles that mention climate change mitigation in cities. We built a database of studies that can be searched, compared and reviewed – and then assessed it for biases in the types of cities and topics that are commonly researched. If you think of a city, which one comes to mind? Most likely it will be a larger and more famous city that is strongly embedded in popular culture: somewhere such as New York or Paris. As it happens, these are the ones that receive most of academic attention as well. 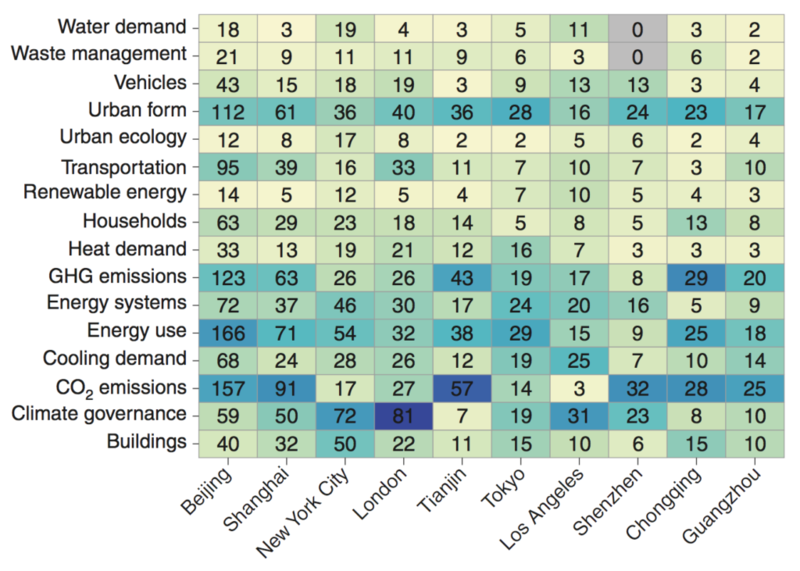 In the figure below, we see the total number of articles written about climate mitigation in different cities, across their size categories. 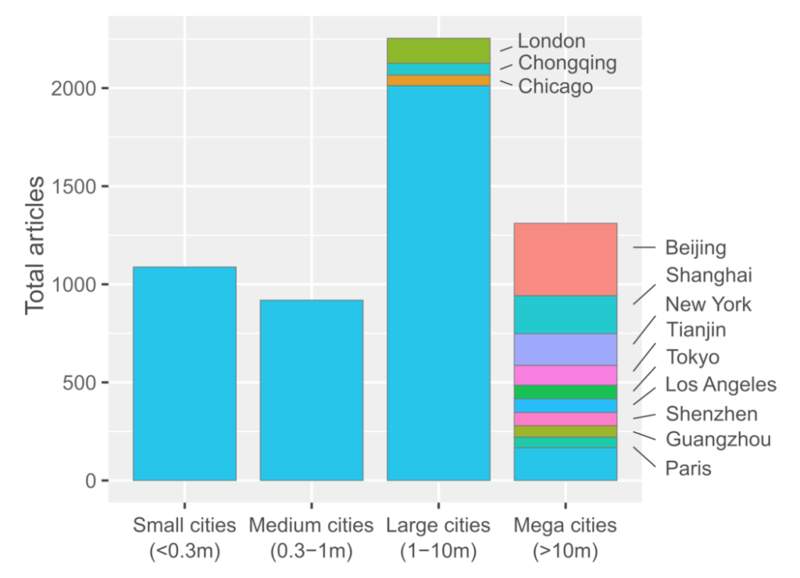 A small number of “megacities” (those with a population of more than ten million people) account for a large fraction of the literature, with Beijing the clear leader (369 articles), followed by Shanghai (194) and New York (161). We also see a considerable number of studies on small, medium and large cities. But contrast this with the data on where people live: the largest proportion of the global urban population (43%) lives in small cities (with less than 300,000 inhabitants) – and yet these receive far less attention than megacities, which are actually quite small in terms of total global population (12%). This bias is made worse by a strong regional focus in the case-study literature. The map below shows all the urban case studies plotted on a global map (grey circles) along with a summary of the types of topics the case studies from each region tend to cover (blue circles) and not cover (pink circles). It illustrates that most of the cases we have are on cities in Europe, North America and China. In contrast, South America, Africa and other individual countries are left behind in the literature. 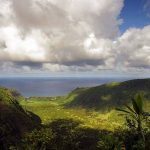 One consequence of these trends is that we know far less about dealing with climate change in cities that are rapidly growing – particularly smaller cities and those in the global south. For example, Kisumu city in Kenya will need to avoid locking-in carbon-intensive growth – including motorways and sprawling infrastructure – if it is to be in a position to reach net-zero emissions this century. By contrast, London faces a very different task in retrofitting the already existing infrastructure of a large city for low-carbon travel. These might include, for example, developing bicycle and public transport networks, and legislating against personal car use. A second consequence is that, perhaps, we are not learning as much as we could from pioneering cities in the global south. As Prof Harini Nagendra – a professor of sustainability at Azim Premji University in Bangalore – argues in a 2018 comment piece in Nature, the south is rich in sustainability lessons, from the impressive bus rapid transit network developed in Curitiba in Brazil, to the bottom-up governance of informal settlements. So, how do we begin to draw out insights from 4,000 case study articles on cities? Our approach is to first map the literature, before diving into an in-depth synthesis. Part of our mapping consists of using computer software to search and “scrape” – or harvest – articles for city names. The second part is to identify the topic content of these articles. For this we use machine learning (or “big data”) methods that essentially train a computer algorithm to read all the article abstracts, pick out the topics they have in common, and categorise them in our database. With this information, we can start to get a handle on the existing research and identify priorities for future work. The grid below shows the number of articles we find on different topics in the 10 most-studied cities. The darker the shading in a box, the more studies found. For example, there are dozens of articles on emissions accounting in Beijing and Shanghai. Low-carbon transportation is well-researched in London, due to its experience with the congestion charge. Yet it is poorly studied in Los Angeles, a major oversight considering the perpetual state of traffic gridlock in this city. At a regional level (shown in the previous figure), there has been very little attention on climate governance – such as policies and processes to promote mitigation – in China, compared to other regions in the world. Armed with a map of studies, we can go beyond merely identifying gaps and towards comparing the different types of urban experiences documented in the literature. Research on zero-carbon heating in Oslo, for example, may not be relevant for climate mitigation in the coastal city of Mombasa in Kenya, but it could be deeply useful to other cold and compact cities. In this manner, combining a map of studies with an understanding of specific urban challenges enables us to move beyond the somewhat anecdotal nature of individual cases, towards learning from actions at a large scale. Of course, our database also allows people to quickly home in on topics and locations that might interest them – such as what happened to congestion charging in Edinburgh? What was the result of efforts in Berlin and Hamburg to bring local energy grids back into public ownership? As the literature continues to grow, researchers face increasing problems to grasp the literature that is out there, assess its relevance, and communicate its policy relevance to society. Our first step into computer-assisted methods results in a comprehensive map of case studies that are quickly categorised by topic and location. Importantly, using machines to read and analyse thousands of articles does not replace the human effort and intuition needed to draw insights from the literature, but drastically reduces the time spent searching and staying on top of new developments. Ultimately, this is just a first step towards learning from urban experiments and delivering on climate change mitigation. 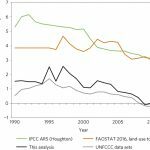 The post Guest post: What do we know about climate change mitigation in cities? appeared first on Carbon Brief.